Rancher Mabel Dobbs at her home in Weiser, Idaho. Today, Mabel is a member of the Idaho Organization of Resource Councils, but she got involved with the Western Organization of Resource Councils 30 years ago, before the Idaho group formed, when her own ranch was threatened by the farm crisis in the late 1980s. “After 20 some years as a banker and a mortgage lender, I married an Idaho rancher in 1984 in Challis, Idaho.” Within their first year of marriage, Mabel learned the plethora of problems that plague the U.S. agricultural system. "If you want to see change, if you want to affect change you have got to get involved," said Mabel outside her home in Weiser, Idaho. Because of their lack of control over prices and policies that affect their livelihood, Mabel and her family have faced every agricultural struggle imaginable, from fighting bankruptcy to protecting their ranch during the farm crisis, fighting for fair contracts and prices, standing up for Country of Origin Labeling (COOL), to protesting the North American Free Trade Agreement (NAFTA), and always worrying about the future of their ranch. The Farm Crisis in the late 1980s was the result of failed policies, consolidation, land price fluctuations, and commodity crop booms and busts. “The banks went to requiring farmers and ranchers to function on a cash flow basis rather than living on assets, which they had done for generations before,” said Mabel. Mabel and Grant Dobbs stand inside their home in Weiser, Idaho. Selling the ranch was never an option for the Dobbs family. “Our retirement could probably have been much better had we sold out the ranch to someone from California and took the money and moved into town. But that was never, from the time that we struggled to stay and ranch and after we lost everything and started over in 1990, that was never a thought that I had,” said Mabel. "We knew our daughter Zane wanted to raise her twin daughters on the small ranch we had fought so hard to keep." It was important to Grant and Mabel to see this happen. After securing their finances and the Mann Creek ranch in the 1990s, the Dobbs were then faced with new policies that threatened their operation. NAFTA resulted in the integration of the North American beef market. The big meatpacking companies in the U.S. began importing live cattle from Mexico and Canada to finish and process. These increased imports allowed the packers to consolidate control over the supply of live cattle and depress the market price for cattle raised in the U.S. When Congress passed legislation requiring Country of Origin Labeling, consumers were able to choose American beef products. Unfortunately for the American rancher, in 2015 COOL for beef was challenged and repealed. Mabel wants to get back to the point where ranching and farming can support a family. That option requires producers having more control over their markets. “As it is now, 33 years after marrying a rancher, our markets are not any better. We don’t have any more control of our market today than we did then.” Policies like NAFTA and the repeal of COOL have impeded the American producer’s ability to compete with foreign and corporate producers and get a fair price for their products. This has discouraged young people from entering agriculture and making a living off of the land. Mabel’s youngest granddaughters, 18-year-old twins, have expressed interest in running the family ranch. 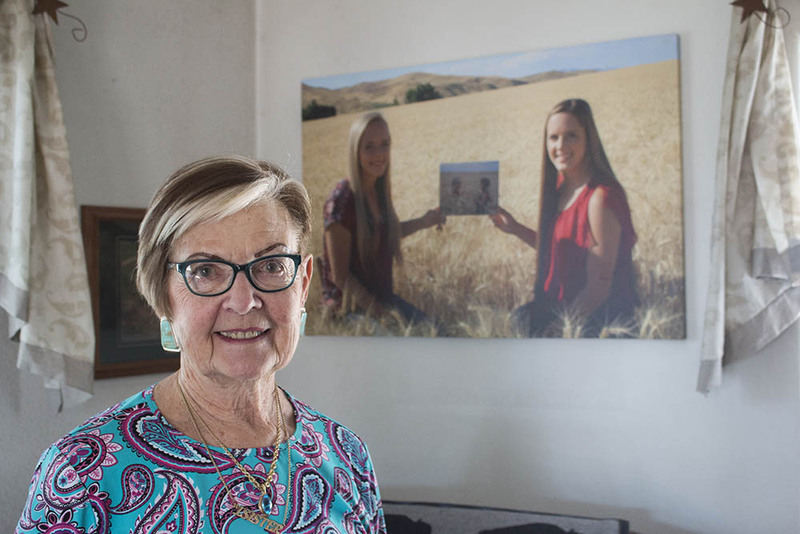 Mabel stands in front of a photograph of her granddaughters in her living room. “Our retirement could probably have been much better had we sold out the ranch to someone from California and took the money and moved into town. But that was never, from the time that we struggled to stay and ranch and after we lost everything and started over in 1990, that was never a thought that I had,” said Mabel. “There’s no way, had their mom and dad not worked off-ranch and grandpa and grandma afforded them the opportunity to acquire the small ranch in the Mann Creek Valley, that this could ever happen. That’s the sad part about where we are at in family agriculture today,” said Mabel, who spent years working in town while also helping run the ranch to make ends meet. For a number of years Mabel got her make-up on and dressed for work in town, then put on her Carhartt coveralls to drive tractor for Grant as he fed the cattle before starting her day as a mortgage lender. "That is just what you do if you love the life," said Mabel.